Formally, two grid lattice points with coordinates (r, c) and (r′, c′) are adjacent if |r − r′| + |c − c′| = 1. A connected region of unfilled lattice points belongs to one player’s territory if all adjacent filled lattice points contain stones belonging to that player (see Figure 1). Finally, a player’s score consists of the number of unfilled lattice points in his or her territory. Figure 1: Diagram of a 9 × 9 Go board. Unfilled lattice points belonging to black’s territory are marked with B, and unfilled lattice points belonging to white’s territory are marked with W. Neutral unfilled lattice points are unmarked. In the game above, white wins by 21 − 3 = 18. The input test file will contain multiple cases, each consisting of three lines. Each test case begins with a line containing three integers, n (where 1 ≤ n ≤ 19), b, and w (where b ≥ 0, w ≥ 0 and 1 ≤ b + w ≤ n 2 ). 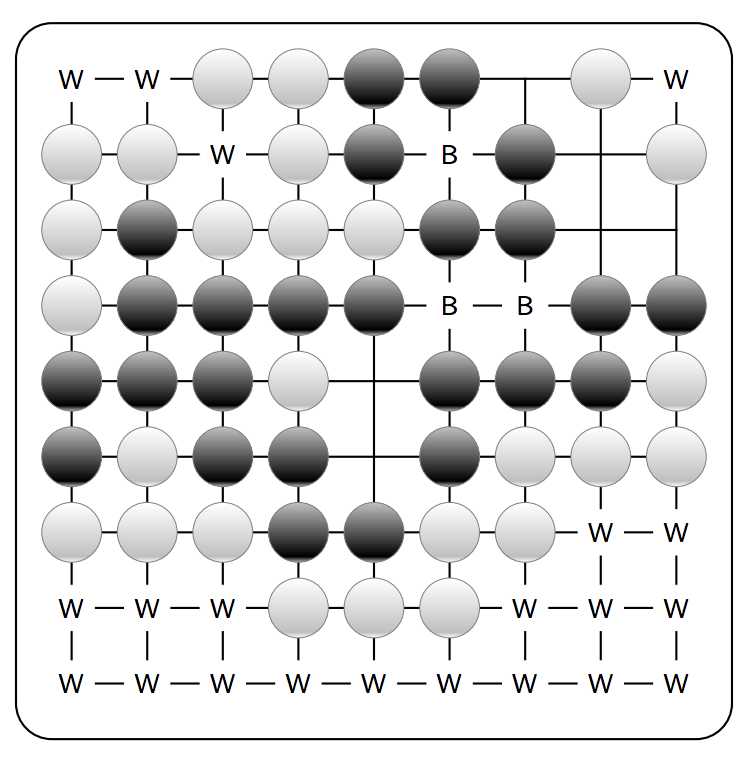 Here, n denotes the size of the board, b is the number of black pieces placed, and w is the number of white pieces placed. The second line of each test case contains b pairs of integers r1 c1 . . . rb cb (where 1 ≤ ri , ci ≤ n) indicating the positions of the b black stones. The third line of each test case contains w pairs of integers r′1 c′1 . . . r′w c′w (where 1 ≤ r′i , c′i ≤ n) indicating the positions of the w white stones. No two stones will be located at the same lattice point. Input is terminated by a single line containing only the number 0; do not process this line. For each test case, print either “White wins by ______”, “Black wins by ______”, or “Draw”.